On February 3rd 2013, Japanese online TV show Puyo-Puyo will be hosting a live stream event. Their guests? Sonic Team. The staff members joining the Puyo-Puyo team are as follows. It might not be related. But… February 3rd is a day after Groundhog day, a day which Sega have unofficially called ‘Hedgehog Day’ due to their tradition with making big announcements either on or around it. Could it be? It’s already 2011 in Japan and so SEGA Japan has seen fit to kick-start Sonic the Hedgehog and the Puyo Puyo series’ 20th Anniversary year off with the tease that they have a variety of projects in the works to celebrate this milestone for the blue blur and its popular puzzler. What these “projects” are is anyone’s guess for the time being, but we’ll keep an eye out for new info and media in the year ahead. For now, you can check out a teaser website for Sonic’s 20th that is now live, though there’s not much to see at the moment. 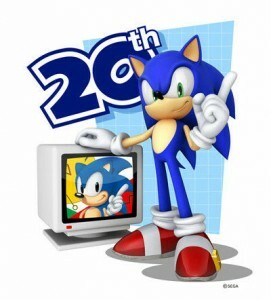 What would you like to see for Sonic’s big 20th Anniversary? Speak out in the comments. A new Puyo Puyo game. Sonic Team have updated their teaser web pages and revealed the secret of the mathematical apple-chucking trailer – it’s an excuse to bust some colourful Puyo in yet another edition of the addictive puzzler. Puyo Puyo 7 is destined to hit the Wii, Nintendo DS and PSP later in the year, according to Famitsu magazine, with the DS version hitting retail first at the end of July in Japan. Just like the last major console release, Puyo Pop Fever, it’s possible we may see a Western release later, at a budget price. Many had been suspecting the Project RINGO teaser was related to Puyo Puyo as flash banners had appeared prominently on Sonic Team’s website for the franchise. The curious nature of the countdown trailer led some to believe a new IP from the studio was to be announced, but now that’s clearly not the case. Puyo Puyo has had various releases in the West under other names. 1990s gamers may remember the format in the form of Kirby’s Avalanche on the SNES and Dr. Robotnik’s Mean Bean Machine on the Sega Mega Drive. The franchise enjoys a fair amount of popularity in Japan.